What wouldn’t we give to know whether someone was telling the truth? What if someone told you he was lying, but you believed him anyway? What if a magician held the secrets to making money without working? To becoming a perfect judge of character? To making you smarter? To know what you were about think and do before you did? What if it were true? Would it be real or just a bunch of Lies, Damn Lies and Magic Tricks? What is real? What do you think is real? These are questions that lie at the foundation of magic. In his own stylized manner, James Alan seeks to open that dialogue up and turn it on its head. 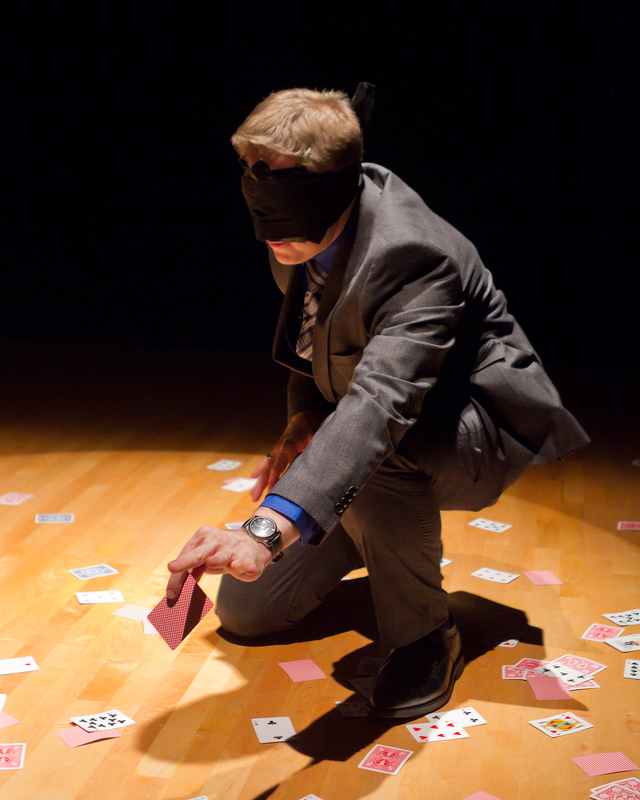 During the course of his performance, Alan never loses sight of the notion that magic requires a sort of social contract between prestidigitator and audience member. I, as the observer, must agree to believe him, even if I know that he doesn’t play fair; he, in turn, makes magic happen that evokes wonder and, ultimately, turns any conclusions I might draw on their heads by the very end. What we believe and what we refuse to believe is toyed with and pushed to its limits by one feat after another. Take, for example, a trick many of us have seen before, in one variation or another: 3 cups, 3 balls, a magic wand “to Harry Potter this”, Alan quips. Even I once performed a simplified version of this with a child’s magic kit (and it was fun!). Balls shift from cup to cup as the audience watches, invited even to call out for which cup should be the final resting place of these mischievous red orbs. Alan goes so far as to tell the audience plainly how he’s accomplished the illusion – only to then change the game entirely, leaving the audience in a state of pleasant bewilderment. The trick we’ve been watching is not the trick at all, but the set-up. Like any staged show, it’s crucial that a performer be able to win over audiences, maintain their attention and engage them. This is something at which Alan particularly excels. Opening his show with banter that establishes the through-line, he moves seamlessly from feat to feat, making amusing comments along the way that build a sense of camaraderie with the crowd. There is no sense of grandiosity about him; everything is tongue-in-cheek, with moments of intentional “failure” that lure onlookers into feeling he is “one of them”. And then, of course, he pulls an egg from thin air and you remember that he knows something you don’t, yet desperately want to know. That desperation is only amplified by the constant audience involvement in the show. Participants are invited on stage and find themselves suddenly tossing imaginary cards to others or confessing their craziest ideas. With a little coaching, another conjures up the aforementioned egg. It all takes the show just that little bit further, making it a much more satisfying and immersive experience. Maintaining the through-line is also vital for a performance like this and Alan never allows us to stray far from its premise. Everything is brought back to that core message in a way that is neither heavy-handed nor obtuse. It is as natural as telling a story at a party, recalling details and meandering into side details, but always coming back to the heart of the matter. Consider it a conversation with excessive hand gestures, herbal loose leaf tea, lemons and duct tape. That sounds far more adult than it ought to. Did I mention nuts? I am a rather ideal candidate for this show: Alan seeks out intelligent individuals, people who wish to wonder and think. I have also had a long-standing love affair with magic, particularly seeking to deconstruct how illusions are performed. I am sitting here hours later, still trying to tear apart the final moments of the show. I have theories. I have the information Alan has fed me for an hour. But can I trust a word of it? Can I trust what I’ve perceived? After all, it was all just lies, damn lies and magic tricks, right? James Alan performs August 18th and 19th at Summerworks and really, he ought to be your top priority. You have the opportunity to acquire a shiny $50 bill and be entertained. For show times, location and ticket details, click here.